A unique coupling mechanism was applied to the design of fundamental-frequency VCOs at frequencies through 4.2 GHz with significant reductions in phase noise. These compact coupled planar resonator (CCPR) VCOs were developed to offer a lower-cost alternative to more expensive ceramic and SAWbased VCOs. And unlike the ceramic and SAW oscillators, the planar resonator approach readily lends itself to semiconductor processing methods for fabrication of integrated-circuit (IC) reference oscillators. Several units have been fabricated for use at 144 MHz, 200 MHz, 433 MHz, 622 MHz, 1296 MHz, 2488 MHz, and 4200 MHz using three-layer printed-circuit boards (PCBs) in a package size measuring a mere 0.5 X 0.5 in. Models can be designed for frequencies from 100 MHz to beyond 4.2 GHz. A 622.08-MHz (SONET/OC-12) VCO was among the first oscillators fabricated with the new design approach. Its phase-noise performance was characterized with resonators in both uncoupled and optimally coupled states using Signal Source Analyzer (R&S), with the results shown in Fig. 2. The typical output power measures +4.721 dBm, while requiring less than 40 mA of current from +12-VDC supply. For the coupled performance, the measured phase noise at 10 kHz from the carrier is –136.0371 dBc/Hz, at 100 kHz from the carrier is –156.8752 dBc/Hz, and at 10 MHz from the carrier is –165.8243 dBc/Hz. In comparison, the uncoupled performance showed noise that was about 16 dB higher in level.1-3 A DC tuning voltage range of 0.5 to 8 V translates to sufficient tuning bandwidth that allows for reliable stable longterm performance. The harmonic rejection is typically 30 dB within the specified tuning voltage bandwidth. The performance of the CCPR technology is well suited to replace voltage-controlled SAW oscillators (VCSOs) in phase-locked applications. Besides the similar performance in phase noise, these new VCO's also allow for wider tuning bandwidth and tuning sensitivity. The extra tuning bandwidth makes the CCPR technology superior to VCSOs SAW oscillators in terms of thermal stability, aging, and unit-to-unit variations. The CCPR technology is ideal for applications in narrow frequency bandwidth/fixed frequency phase-locked clocks or sources in the IF converters of high-performance test instruments and communication systems. The DCSR series of VCOs from Synergy employ this technology and rival SAW-based oscillators in reaching ultralow phase noise performance, while surpassing SAW oscillator performance in bandwidth, overall development costs for uncommon frequency bands, tuning agility, and long-term reliability. 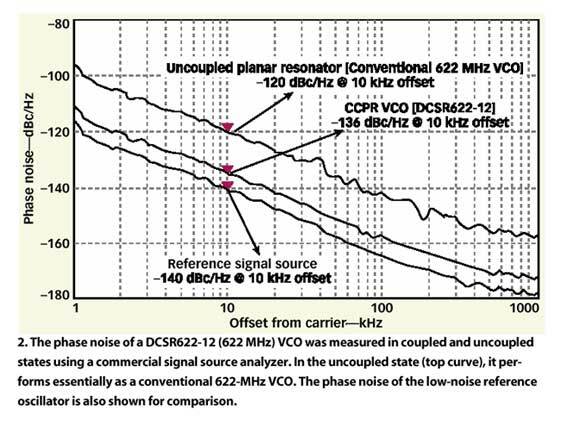 Model DCSR1296-12 (1296 MHz) is another example resulting from this technology. The VCO features measured phase noise of typically –124 dBc/Hz offset 10 kHz from the carrier and requires less than 40 mA current at +12 VDC. The current and expanding product offering from Synergy Microwave Corp. offers outstanding performance from packaged oscillators measuring just 0.5 X 0.5 in. It is important to note that these oscillators deliver fundamental output tones, reaching microwave frequencies without benefit of frequency multiplication, where SAW technology has limitations. U.L. Rohde and A.K. Poddar, "Tunable Frequency, Low Phase Noise and Low Thermal Drift Oscillator," United States Patent No. 7196591. U.L. Rohde and A.K. Poddar, "Wideband voltage controlled oscillators employing evanescent mode coupled resonators," United States Patent No. 71803812. U.L. Rohde, A.K. Poddar, and R. Rebel, "Integrated Low Noise Microwave Wideband Push-Push VCO," United States Patent No. 7,088189. U.L. Rohde, A.K. Poddar, and G. Boeck, Modern Microwave Oscillators for Wireless Applications: Theory and Optimization,Wiley, New York, 2005. U.L. Rohde, "A New Efficient Method of Designing "Low Noise Microwave Oscillators," Dr.-Ing. Dissertation, TU- Berlin, Germany, 12 February 2004. A.K. Poddar, S.K. Koul, and Bharthi Bhat, "Millimeter Wave Evanescent Mode Gunn Diode Oscillator in Suspended Stripline Configuration," Infrared & MillimeterWave 22nd International Conference Digest, pp. 265-266. U.L. Rohde and A.K. Poddar, "Multi-Mode Wideband Voltage Controlled Oscillators," IEEE ICECS 2006, Nice, France, December 10-13, 2006. A.K. Poddar, J.K. Bansal, and K.N. Pandey, "Millimeter Wave Evanescent Mode Power Combiner Gunn Oscillator in Suspended Stripline Configuration," Mathematical Methods in Electromagnetic Theory, IEEE/MMET International Conference Digest, June 1998, pp. 384-386. U.L. Rohde, A.K. Poddar, Juergen Schoepf, Reimund Rebel, and Parimal Patel, "Low Noise Low Cost Ultra Wideband N-Push VCO" IEEE Microwave Theory & Techniques Symposium Digest, June 2005. A.K. Poddar, "A Novel Approach for Designing Integrated Ultra Low Noise Microwave Wideband VCO," Dr.Ing. Dissertation, TU- Berlin, Germany, December 2004. U.L. Rohde and A.K. Poddar, "Novel Multi-Coupled Line Resonators Replace Traditional Ceramic Resonators in Oscillators/VCOs," IEEE International Frequency Control Symposium, Orlando, FL, June 5-7, 2006.